Japan just can't seem to catch a break when it comes to demons. 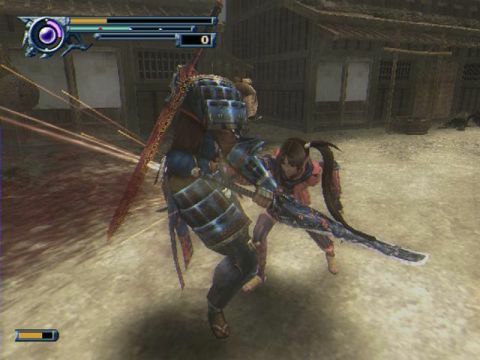 Dawn of Dreams takes place fifteen years after the original Onimusha trilogy, but the action-packed essence remains fully intact. Emperor Hideyoshi is up to something unspeakable with the nation's cherry trees, and plans to turn every last citizen into a mindless drone under his command. Your only recourse is to stop this evil with lots and lots of bloodshed. You start out controlling only Soki - a blond samurai ogre with two giant broadswords - but before too many hours have passed, you've got a full stable of five fighters to choose from, each sporting a set of unlockable signature attacks and combos. Killing monsters and absorbing their souls will slowly power up your avatars from well-dressed gimps to minor deities, and as your basic hack-and-slash attacks are upgraded, new and more advanced forms become available. These can be leveled up as well, and range from Soki's brutal "head splitter" to gun-toting Ohatsu's explosive "fireworks." Each ally also hides a secret form that's set loose with an "Oni Awakening," giving you a frightening new visage, limited invincibility and other secrets to discover. Their weapons - which include swords, staffs and guns - can also be upgraded. And if both your onscreen characters are wielding sufficiently advanced hardware, you can unleash devastating combined attacks that unleash destructive energy everywhere. Description The series tries for a fresh start with a genuine ogre playing the hero. Get ready to mix it up with demons yet again.